The state banquet in Fiji tonight brought us our first opportunity to see the Duchess on duty in formalwear. Wearing a “Fiji blue’ dress by British luxury label Safiyaa and some serious diamond jewelry, the Duchess looked radiant. A video of the couple descending the hotel stairs. 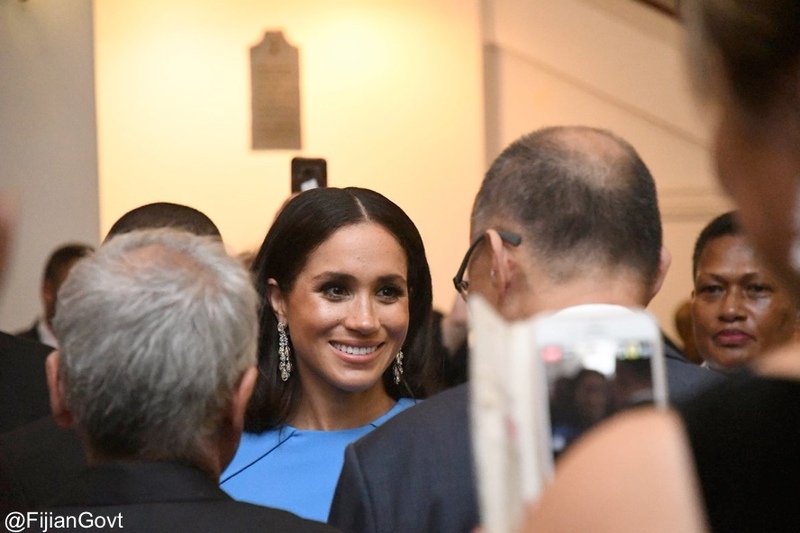 The event was at the Grand Pacific Hotel where Meghan and Harry are staying. It was hosted by Fiji’s President Jioji Konrote, seen second from the right below. To his left is First Lady Sarote Konrote. On the far left, Dr. Jiko Luveni, Speaker of Fiji’s Parliament. 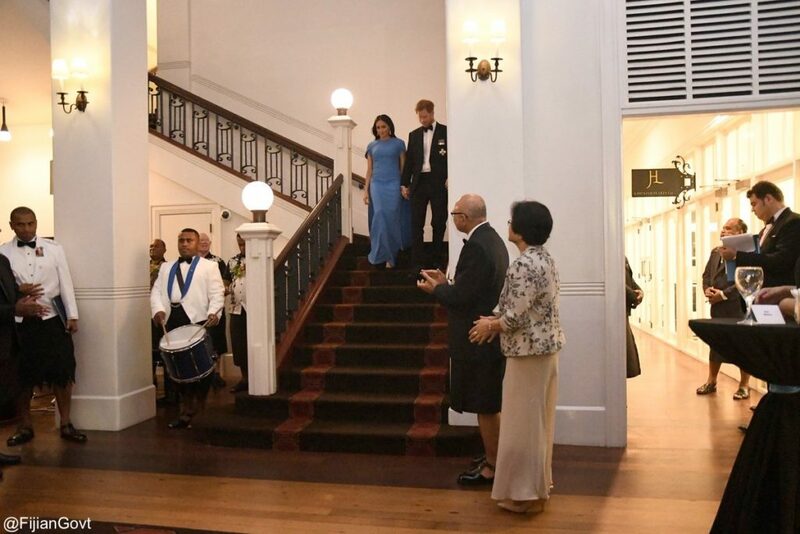 Guests, including diplomats, local business leaders and the cream of Fijian society, gathered for the champagne reception ahead of the state dinner at the Grand Pacific Hotel where the royal couple are staying during the visit. Following dinner, Prince Harry addressed the guests. Lizzie Robinson of ITV was in the room and heard Prince Harry’s speech. Now for our look at what Meghan wore to her first state banquet. 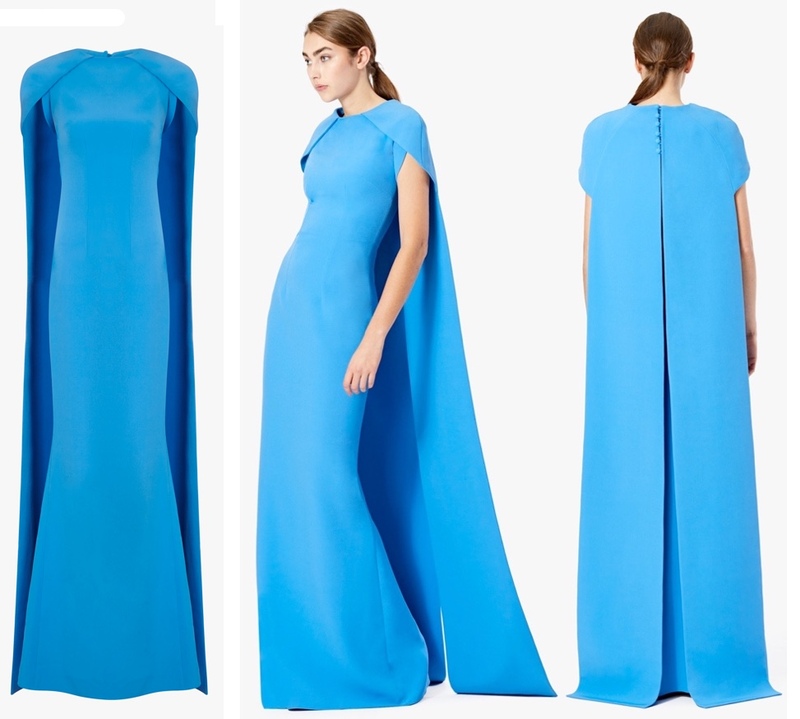 She was in the Gingko Cape Dress ($1431) from Safiyaa. It is described as a “Full-length fitted short sleeve cape dress with a long tailed back with a deep split and covered buttons, all in bluette stretch heavy crepe.” The dress is done in a blend of 96% polyester with 4% Elastane. 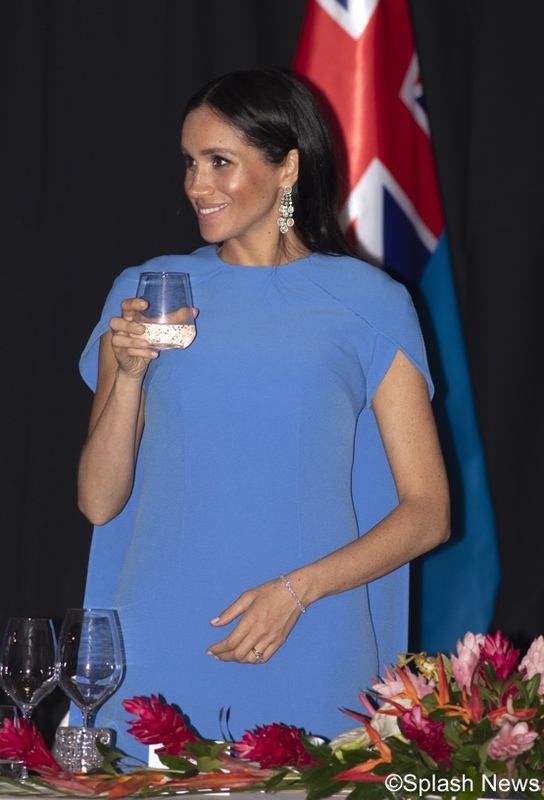 While circulating a champagne reception sounds like the last activity a woman in her first trimester might like to partake in, Meghan rose to the occasion and wore a Fijian-blue gown by Safiyaa that rallied Vogue staffers to herald it as the dress of the tour so far. 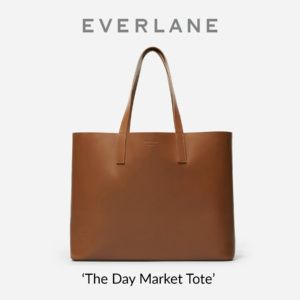 The story behind the London-based brand founded by Daniela Karnuts also bolstered the vote. Three Safiyaa evening gown styles at Harvey Nichols. Karnut founded Safiyaa, which is named after her daughter, in 2011 out of frustration at the lack of Savile Row equivalents for women. 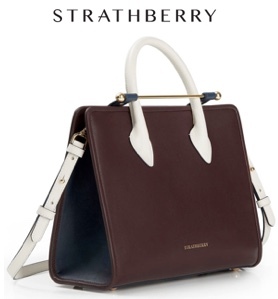 With a demanding career in fashion media, she needed a slick wardrobe of timeless pieces that travelled well. Where her male counterparts could go to the storied bespoke tailoring houses in Mayfair, she was left to piece together her own professional wardrobe. So, with 12 dress designs as her brand blueprint, Karnut started Safiyaa. Daniela Karnuts in an image from the Safiyaa website. 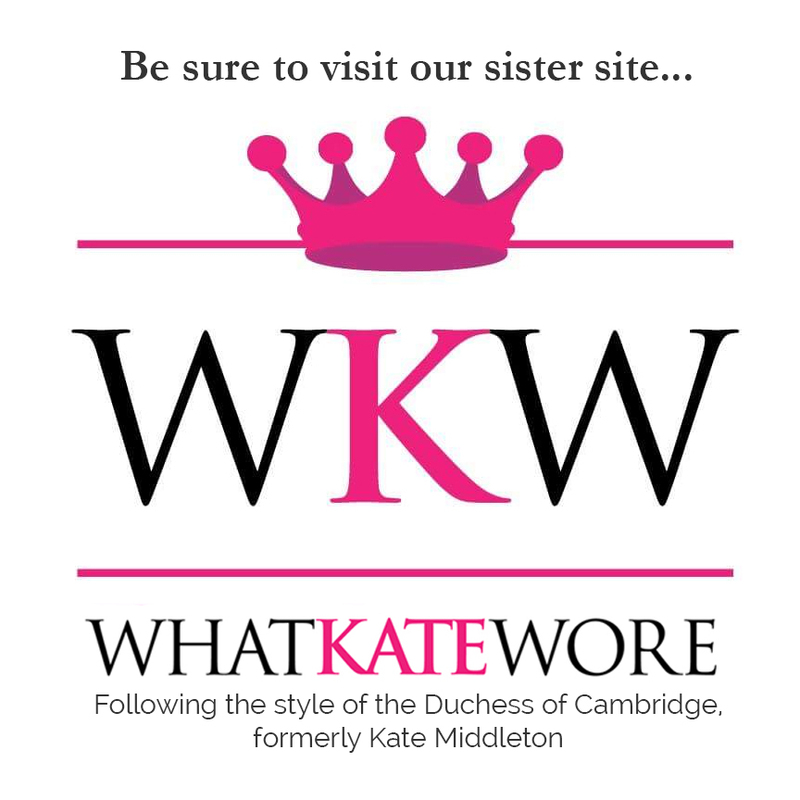 Since its inception it has grown from a dressmaking equivalent of a Savile Row tailor to include demi-couture eveningwear, and picked up celebrity fans including Jennifer Lopez, Kate Winslet and now the Duchess of Sussex along the way. The latter couldn’t be a better endorsement for a company founded on female empowerment. The Duchess also wore two significant jewelry items this evening, a pair of chandelier style earrings and a glittering diamond bracelet. 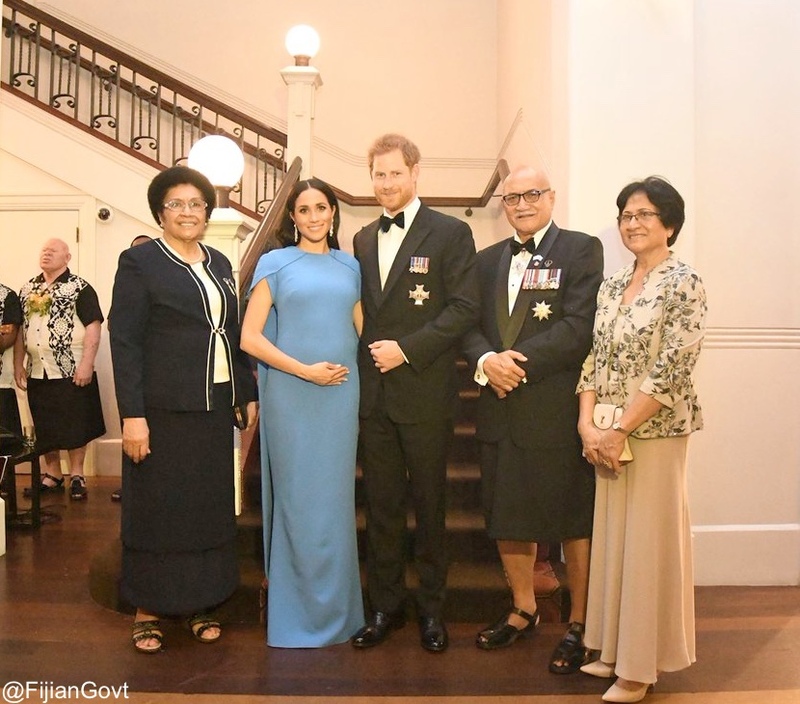 The black-tie dress code in Fiji called for a dressier look, and Meghan’s floor-length dress by London label SAFiYAA delivered in spades. The simple lines of the dress and bold shade of blue made for a slick, modern style statement. 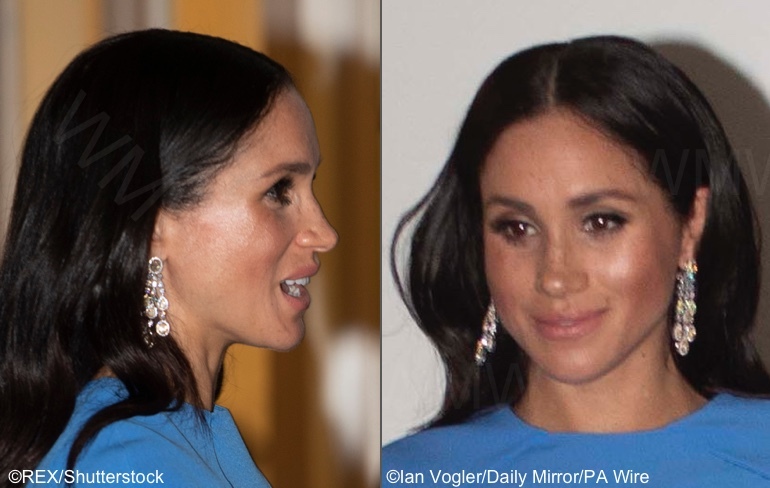 Then – lest we think Meghan’s look oversimplified – she added a pair of drop earrings featuring gobstopper-sized diamonds. UPDATE JAN 8, 2019: It looks like the earrings are by Butani, a Hong Kong-based jewelry firm whose designs are worn by A-listers like Jennifer Lopez, Rihanna, Carrie Underwood and Michelle Obama. 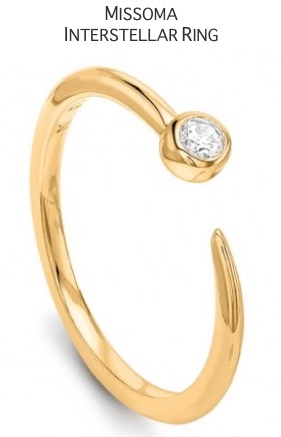 Meghan’s earrings are said to be from a 2016 collection by the jeweler. Below, a Butani ad that offers a look at a similar style. In an October 2016 Hong Kong Tatler story the company is quoted as being desirous of dressing “strong and dynamic women who are trailblazers in their fields.” Our thanks to Meghan’s Mirror reader Courtney M. for sharing the info about the earrings! Meghan did not carry a bag. 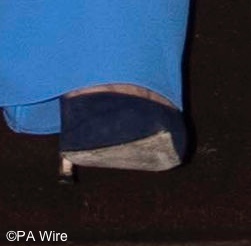 She appeared to be wearing a pair of navy suede heels, but that’s a guess based on minimal information, consisting of this photo and nothing else. We’ll leave you with one more look at Meghan at tonight’s dinner. Click here to read our earlier post on Meghan’s ensemble for the Fiji arrival and welcome ceremony. I liked the Fiji blue dress and I loved the fact that she opted for bigger beautiful diamond earrings. If only she had also worn some bling for a necklace. Enough of the tiny, dainty earrings and necklaces that you need a magnifying glass to see. When you wear a plain formal dress it doesn’t hurt to pair a little nicer jewelry with it. I love this look so much as it so elegant, very “Meghan”, and still has a surprising element of color! This dress is giving me Princess Elsa vibes too, and I’m a sucker for all that! Wow, simply stunning. Elegant, no fuss, no frills just plain gorgeous and the colour is amazing. Just like the tropical ocean that surrounds Fiji. Why no tiara? It’s a state dinner after all? She looks confident, regal, timeless, and serene. That blue is the best color she’s ever worn! Way to go, Meghan! I love the dress but it needed something – embroidery maybe or some dazzle belt ornament, something to break up so much blue. Maybe the inside of the cape lined a different color or texture. Loved the striped evening dress shown, and the caped version with extra detailing. Beautiful! That color and those earrings are superb. And Meghan lsuddenly looks very pregnant, which is so exciting! With her hand on her tummy, you can tell that she is loving it. Love the color and the dress – love the cape and I would take any one of those SAFiYAA dresses. I so love a cape dress or watteau (I had one on my wedding gown). The diamonds are something special – so gorgeous. I hope we find out where they came from. Super stunning. WOW. Why aren’t more clothes made in this shade of blue, it’s so easy on the eye and photogenic. I love the retro vibe of the cape and got kind of an Elizabeth Taylor feeling with these massive jeweled earrings which I agree must not be from the Queen. One reporter said she had brought the Hollywood Glamour which I can easily see. Just like the mystery of the bracelet that Charles gave her, I hope the origin of these jewels will be revealed at some point. I normally don’t like her hair down, especially with a middle part, but this works even though I agree a sleek updo would have been tremendous. I have noticed the propensity for cradling the baby bump and I get it, but like in the group photo, it seems like a bit much. Perhaps she is just self conscious and getting used to her changing body. I was thinking perhaps she cradled her stomach in the photo as a way to mark a moment in time so they could tell their first child in the future – “you were with us in Fiji” – remembering the moment. Simply. Gorgeous. The cape completely elevates the game. The Duchess has been hit or miss on this tour but this look is fabulous! The color is gorgeous and the dress is a perfect combination of modern and cutting age with classic and royal. The hair and earrings are stunning as well! I feel like Meghan is finding her way, fashion wise. I hope she continues on this path and leaves some of the ill fitting ensembles and awkward length skirts behind. Am joining the minority who don’t like this dress. I should say that I don’t like cape dresses to begin with. I didn’t like Meghan’s Stella McCartney cape dress, nor Kate’s pink one. Wear a cape, or wear a dress, or wear the two separates together, but as one piece, never. Meghan is simply overwhelmed by masses of relentless blue fabric. If the dress does have clean spare lines I must be missing something, because to my eye the dress is overtaken by the cape. I can’t imagine what it looks like on her from behind, but the photo, with the inverted pleat and the buttons, looks smothering. I want to like it but I simply can’t. The earrings, though, are gorgeous and it’s a pleasure to see her wear statement jewelry instead of the tiny pieces she usually favors. When I saw the three other designs, I wished Meghan had chosen the striped one, or something similar. She looks great in dresses with wide straps and the cut of the dress would’ve been flattering for her. (Guess I’m still in love with her first sun dress.) Well, I hope for a better choice next time. I agree this is a total miss. Don’t like it at all. You are not in minority, I don’t like the dress. Bland and very old for her. She can wear a completely dead dress like this when in her 80s, why so early? Also colour is simply strange and hairstyle too informal for both the dress and the occasion. The trip is a major disappointment fashion-wise, in oarticular in Australia! This is the best dress Meghan has worn in a while. Love the color and shape with the Cape! I thought the whole look was on point. I’m not sure why she’s cradling her stomach at this point considering she didn’t look like she even had a bump in previous outfits, but maybe they’ll save a copy of the photos and remember that she was pregnant on the trip? A very thin friend of mine explained her tendancy to clutch her tiny bump as her unconscious reaction to having any sort of tummy. Sort of unconsciously letting the world know it wasn’t a tummy or large lunch to be hidden but a bump with a purpose. At ~4 mths pregnant a normally rail thin person with a flat stomach can feel a little shapeless and even dumpy in the early stages when you are thick around the middle but not obviously pregnant. As a far more curvy build I wasn’t used to having a flat tummy or a six pack so a new tiny bump wasn’t such a weird change to my shape. Oh Meghan with a cape! Gorgeous!! This is a WOW factor dress if I ever saw one! Love it!! Drat, my comment got eaten. Well, what I wrote was not much different from what others have. This is a knockout. A gorgeous, meaningful color; major diamond earrings; and such long, slender lines treating that tiny baby bump so kindly. The only thing I might have done differently is the hair; I would have liked to see it up to show off those earrings even more. She wears it up often enough of course, with her signature messy bun that I love. But given that this is essentially her royal debut in formalwear (apart from the wedding), and her first state dinner, it might have been nice to see her with a proper formal updo. And a tiara! Meghan continues to be genuine, relatable and at ease whatever situation she is in or whatever event she attends. Tonight she looks beautiful in the Safiyaa evening dress and I like how she wore her hair down to soften the look and also to allow the strong lines of the dress to be appreciated. The diamond earrings are sensational and I can’t wait to hear more about them! The color is just gorgeous and she looks elegant, but I can’t say I love the dress. In some photos it looks like a mass of blue fabric. It lacks dimension. I think a different neckline or some detail or seams would have made a big difference. Maybe even a darker blue on the inside of the cape. I will say that the simplicity does highlight those incredible earrings! It may just be the light but they look to be a mix of yellow or champagne and white diamonds. Beautiful! I like her hair as well. It is not what I would think of as formal hair, but it looks modern and glamorous. Love the simple elegance of the ensemble. I couldn’t help noticing a slight fish tail bottom to the gown which adds to its appeal. The earrings are a stunner. Love it! Ditto on your observation of Meghan ensemble. The front of gown needed to be hemp a inch shorter, but the fish tail bottom was perfect, as I have said before she needs a tailor on staff. 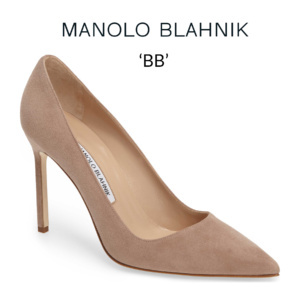 The suede navy pumps were all wrong, what would have looked terrific is a strapy silver sandal or pump. She looked stunning, I’m not sure if I really like that blue on her and when looking at your post seeing the similar style dress in the deep teal, that would have been lovely on her. I love that she has some impressive earrings. Gone are the days of tiaras for state dinners it appears, woe is the inner magpie in me, missing those days. Kate just wore a tiara to a state dinner, so those days are not gone completely! Maybe there’s no tiara for Meghan because she’s not married to the heir? I’m not sure if there are any rules about that. 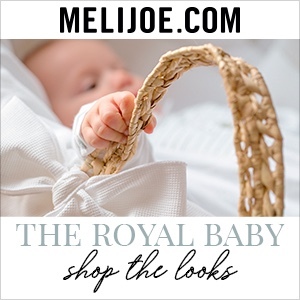 Too bad – I would have like to see Meghan rock a tiara. The earrings are fabulous! The color is gorgeous, the dress is beautiful, but the cape… Why? I often don’t understand high fashion dresses, and it’s the case here. We don’t see it on Meghan, but the cape looks even more over the top from the back. It adds the unneccessary volume to the ensemble, and I just can’t like this outfit. Sorry. It could have been a win for me. BTW, Kate wore a very similar design of a dress recently, and I disliked it a lot on her as well. Wow! What a showstopper. That dress is gorgeous. I love the color on Meghan. The earrings are to die for. Just beautiful. I love the colour and cut of the dress but I’m afraid I’m not a fan of the cape. I adored the cape on the shorter navy dress but, to me, this just has too much fabric. I really want to love all of it but the cape doesn’t work for me. The diamonds are a triumph. This look is stunning. The walk down the stairs sealed the deal for me. When I saw how the dress and cape/train moved…just perfection! Amazing cut and angles, very modern and almost severe, but then so dramatic with the pleated train trailing behind. The color is beautiful and the jewels are divine. I’m guessing if the earrings were loaned by an unnamed source, they did NOT come from the Queen. More likely a private loan from a jeweler or friend. Altogether just lovely and every inch a modern duchess. My guess is the earrings were a loan from Camilla which would have been very kind. You can totally tell the DoS has a significant experience being in the public eye. She is transitioning beautifully to being a working royal, and at least from the sidelines is managing to do it while maintaining a seriously natural feel. It is very curious for me, being a follower of both Kate and her, how the different backgrounds are showing up in their styles. To me, Meghan is confident enough really early on to be both more natural when the occasion allows, and more flashy when there is call for it. 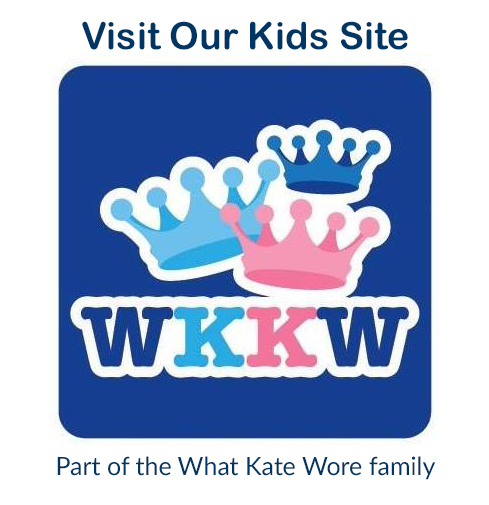 Kate seems to always strive for the golden middle ground, and sometimes that makes her overly cautious. I love them both, but I love seeing how they are different most of all. We will never know, of course, but I would love to know that they are managing to become real friends. Having each other’s back will be an invaluable asset for both of them. I can really see them shoring each other up and becoming better through having a different point of view. This isn’t one of my favorite looks, it is my MOST favorite looks on the DoS. The style is simple which we know she favors but the color and jewelry takes it to a look fit for Dutchess. I think she looks stunning but I hope she gets more rest soon. I don’t like this look at all. IMO it is a case of less is waaay less. Both the dress and the earrings overwhelm Meghan and her hairstyle drags the look down even more. And, what is with the mystery lender of the earrings? Somebody says “probably the queen” but really, if it was the queen why not say so? By saying only that they were borrowed and not naming the source it seems to insinuate some nefarious source absolutely NOT the queen. Can you think of any other royal described in the media as wearing something borrowed from an unidentified source? Meghan is a beautiful young woman but I think in her desire to keep things simple and classic (as seems to be her taste) she missed the mark with this outfit. Hi Donna, jewels and tiaras have been loaned to royal families throughout Europe on many occasions, sans “nefarious” activities. Perhaps it doesn’t happen as often with *this* royal family as Queen Elizabeth has amassed quite a collection. Nevertheless, it happens more often than one might realize. The website The Royal Order of Sartorial Splendor did a nice article explaining how it works a while back. Agreed – the surprising aspect for me is that they don’t seem to be part of Her Majesty’s vast jewel collection, but it’s highly unlikely there wasn’t any suitable sparkle there that would work with this dress. The Queen has already loaned Meghan a significant piece in the wedding bandeau, odd that she wouldn’t do that for this tour – especially since she has for Kate on her Royal Tours. Looking forward to mystery solved. I agree! The only reasoning I could think of was that perhaps due to the length of the tour, they didn’t want to run the risk of HM’s jewels getting missplaced, stolen or otherwise lost? Perhaps there was a local jeweler that loaned out the baubles for the event. I guess I’m in the minority so far but this dress is not my style. I’m just not a fan of cape dresses. I didn’t really care for Kate’s blush pink McQueen gown in Sweden, even though that one was also so beloved. I will say that I prefer Meghan’s dress to that one, I think the sleeve length is more flattering. And I do love the bright colour! But most importantly, those jewels!! At first I thought it a shame that Meghan kept her hair down, but those diamonds still sparkle against her dark hair. Great choice. I love that she is (presumably) wearing so much of the Queen’s jewellery in Fiji, it’s a nice callback to the Queen and Philip’s marathon tour in the 50s. Credit where credit is due – Meghan looks polished here, gleaming from hair to smile to beautiful jewels, beautiful color on her, hallelujah, with the clean lines she favors. Very suited to her, though she seems to be a lot farther along in her pregnancy than just hours before at her arrival, crazy how different clothing gives such different looks! This is a lovely success. 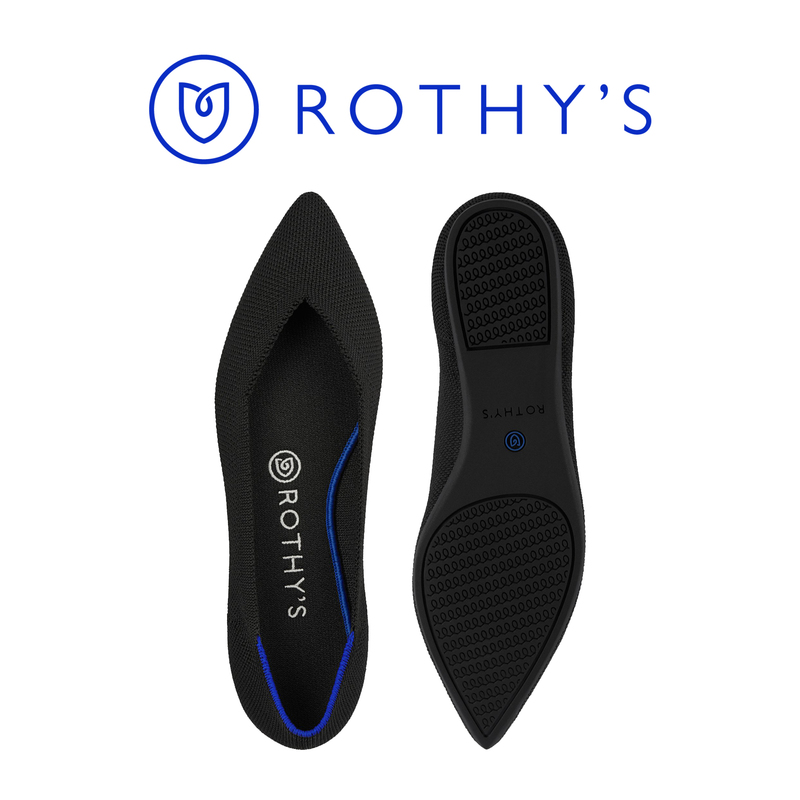 Perfect color, perfect jewelry, perfect fit, perfect posture! Meghan looks stunning and what a perfect non-maternity dress for her second trimester. This is definitely one of my favorite looks of hers so far! This to me is by far the best dress of the tour! She looked radiant and a classic beauty. The fitting was perfection! I do love the cape dresses and this one did not disappoint. A lovely idea for a formal dinner, but I would have liked to see it performed differently. I don’t like the cape in the same material as the dress, it looks like such a big block of color. If the cape were more sheer, like chiffon maybe, it would make a much more translucent and ethereal impression. 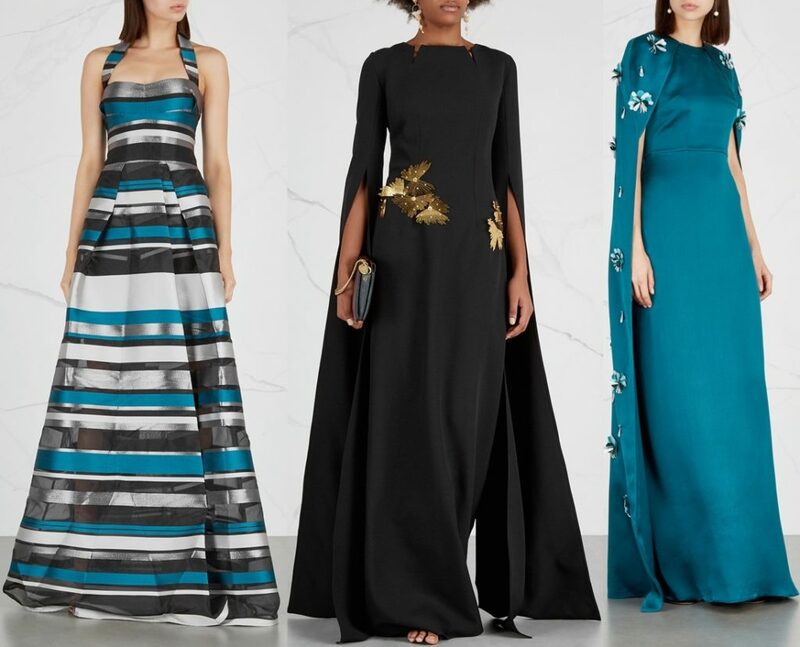 I also love the black dress with the long sleeves (the one in the middle of the different safiyaa styles), I crave to that in the petrol color from the right one on Meghan! Also a great fan of the diamond-jewelry! As for the shoes – is that really suede? And in a different tone of blue? Surely that could have been done better! Thankfully the dress mostly seemed to cover those! Meghan has been looking great and happy this whole tour, pregnancy seems to be suiting her just fine, bless her. Great job on all these posts too!! Everything comes together so quickly it seems and its always tasteful, fun, and informative. Twelve car pile-up gorgeous. Just a fabulous gown — just the right color, elegance, and style. The earrings and bracelet take even that dress up a notch. Her hair looks lovely and she looks radiant. Love everything about this dress and the styling. The color is glorious on her and she sure sets the bar high for an active pregnancy! She and Harry look very much in love and IMO they’re doing the Crown proud on this tour. I know many will be thrilled to see Meghan in a color, but I’d like to make a case for her wardrobe of neutrals which is standard for chic women the world over. Meghan is an independent young woman with her own taste and I hope she’ll feel free to wear the color palette she favors. Stunning from head to toe! I love an elegant evening dress that still manages to look comfortable. Given that this dress was selected well ahead of the baby announcement, how are the alterations accomplished? Perhaps she or her stylist orders it one size larger than normal, or they order a customized version with a slightly relaxed waist and nobody knows who it’s for in advance. Or, does every dress that isn’t off the rack require a non disclosure agreement with the designer so it could be ordered with a looser waist well before the pregnancy announcement? I’d love to know how that whole process works. 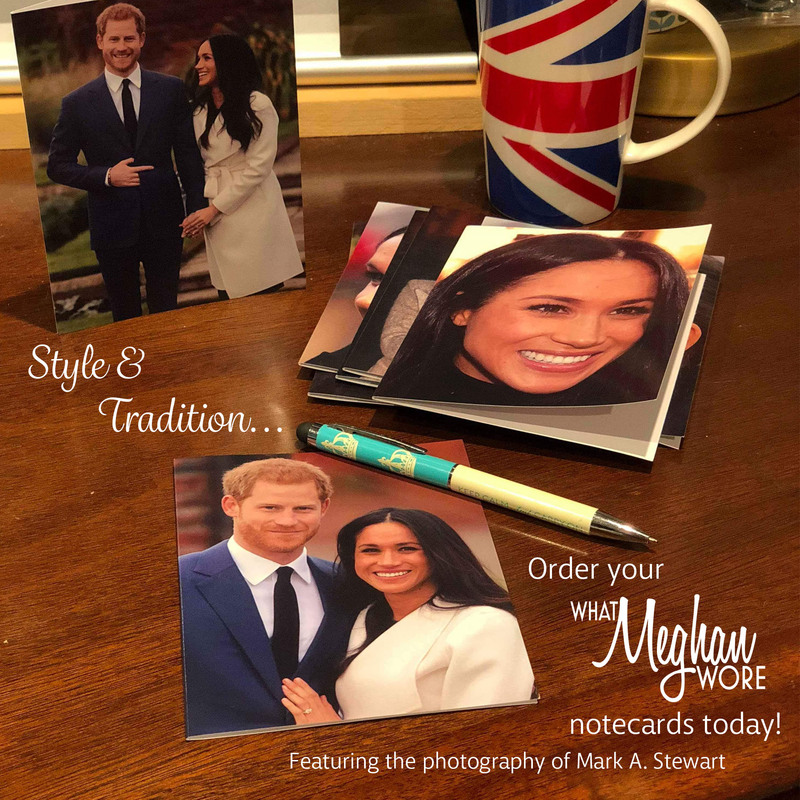 I always imagine the royal family has credit cards with fake names and a nondescript post office box so they can order things and have staff pick them up. That is a great observation, I didn’t even think about what would have happened if she put this dress on and it was too tight due to her pregnancy, yikes! She’s been very lucky that so far everything is fitting pretty normally, regardless of the different degrees she’s showing – there have definitely been fluctuations, but I haven’t seen anything yet with a really bad fit. Great Tour karma! She looks very pretty. Those earrings are indeed quite large! Besides the queen, who else could she have borrowed them from? I don’t really know how all of that stuff works, if it is official or if it is just her walking into Gran’s room and saying, “Meemaw, I’m borrowing the bubble diamonds today!” And then the queen says, “Of course, dear, but don’t forget the tennis bracelet!” And then they belly-laugh in their Juicy sweat suits and play horse shoes with tiaras. I think these pictures vindicate Harry and Meghan’s decision to announce her pregnancy right as their tour started and lessen all the “She stole Eugenie’s thunder” criticism. You can totally tell from that picture of her side profile, it’s unmistakable. Not to mention all the events she would be present at where alcohol would be present like this one! Well, the Fijian blue is a happy colour and a thoughtful nod to her hosts. It was also a pleasant change from the navy, black, white palette. I don’t love this dress; it is a bit too minimal for my idea of an evening gown, for a state dinner. I have, however, come to realize that minimalism is Meghan’s style and she is true to herself. The earrings are the most bling that we’ve ever seen on Meghan and the gems are spectacular! Let’s hope there will be more borrowed jewels and additional bling as the years go by. I do love a good cape dress! In some pics, the color’s a great match for the Fiji flag, a nice nod to the hosts, if it’s true. And the diamonds. I’d loveeee to know the origin of the diamond earrings. No wonder she wore white for the arrival ceremony! Because she had this beautiful color waiting in the wings. I originally thought her heels were black but I’m thrilled to see that they’re blue. I believe her baby bump may have doubled in size since the first day or the trip, and that’s a very good thing. Happy, healthy babies are growing babies! Meghan looks amazing. That blue is incredible on her, and those are some serious diamonds! I love that blue/black/silver/white striped dress in the photo of the three dresses. I could see Meghan in something like that. Quite glorious. What a beautiful color–and apparently a meaningful one too. The way this dress caresses the little baby bump and still creates a long, lean line is really remarkable. And the jewelry has a real wow factor. I only wish she had worn her hair up, to better show off those beautiful earrings, and to give just that much more punch to her first official appearance in formal wear (apart from the wedding, of course). Her hair *is* so often up, but generally in her signature loose bun; it would be really something to see her with a proper formal updo. Perfection! I can’t get enough of caped dresses (and have few enough opportunities to wear them myself, even if I owned one! ), so thank you Meghan! Dying to know more about the earrings and whether they’re still more evidence about unseen wonders in HM’s vaults. Meghan really knocked it out the park here and hit our colour-starved senses for six! A most brilliant and accomplished ensemble from our budding Duchess. And she tops it all by showcasing another amazing new UK label. I am entranced by how deftly those tulip sleeves have grown effortlessly into a dramatic cape feature. It’s wonderful to have detail at the back as well via buttons and the deep pleat. The cut of the dress is completely flattering to Meghan, skimming easily over the bump and giving her some seriously class maternity wear. The colour is sensational. 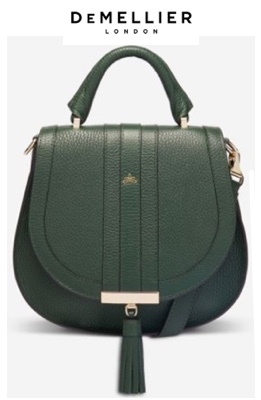 Clever Meghan to stick to earth tones and neutrals up to now and then step out in a such a show-stopper. The diamonds are mega. Epic. As with the colour, Meghan’s fabulous skin tone can take pretty much anything she throws at it – are those yellow diamonds glinting in those tremendous chandeliers? This has to be the state dinner debut to beat them all. Beautiful color on Meghan. The earrings and bracelet definitely take it up the required notch. I might have preferred her hair in a low chignon, but that’s a minor quibble. Hopefully, my final comment doesn’t veer into forbidden territory, but I’m starting to think she is either much farther along in this pregnancy than has been indicated or she is expecting twins. How exciting would THAT be? I’m happy to see here in some significant jewels- the dress called for them. And she carried them off beautifully! Beautiful colour and elegant styling of the dress. Jewelry exquisite. One of my fav looks ever from her. Absolutely perfect and timeless. Love it. The simplicity of the dress, with the cape, and then the diamonds to take the whole thing up a level. This is one of my favorite looks of hers so far. Love the color.